Aloha & Happy Anniversary, Hawaii! A lot has changed since President Dwight Eisenhower signed the “Hawaii Admission Act” in 1959. Man has walked on the moon and we have inventions such as microwave ovens, wireless TV remote controls, smoke detectors, MRIs and let’s not forget personal computers sinc e that’s the technology helping this article to reach you! And lots of other neat things have come about such as adaptive sports. I recently came across a website for AccesSurf Hawaii. I’ve never surfed and my idea of even snorkeling is to keep the tube doohickey’s opening above water so that I don’t have to figure out how to blow the water out of it. But hey, I don’t need to ice skate or be a gymnast to appreciate the talent and work that I watch on the Olympics. This site intrigued me as we’ve had a few clients and their families who have been profoundly affected by adaptive sports during vacations. 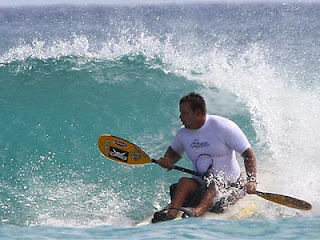 AccesSurf’s goal seems to be enabling people, locals and tourists, to be able to access the ocean to enjoy surfing, swimming, snorkeling and shoreline flotation despite any mental or physical disability. They currently do this on a limited budget and with the help of volunteers on Oahu on the first Saturday of every month. I know there are other places around the U.S. that do a “Day at the Beach”, but I’m not familiar with any that do it monthly. As with any nonprofit organization, funds are always needed for current operations and for growth. The Omidyar Fund at the Hawaii Community Foundation has presented a challenge. If AccesSurf can raise $25,000 by August 31, 2009, the Omidyars will match dollar-for-dollar all monies raised up to $25,000. It’s a lofty goal, but doable. “Aloha” is an amazing and beautiful Hawaiian word that means love, affection, peace and compassion. It’s also used in place of “hello” and “goodbye.” In the aloha spirit and to celebrate Hawaii’s anniversary, Connie George Travel Associates will make a $25 donation to AcceSurf Hawaii for every Hawaii cruise and escorted tour booked through our agency this month. 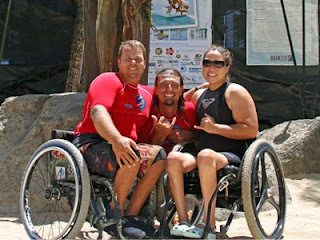 Visit their website at http://www.accessurfhawaii.org/ if you would like to learn more about their program or to make a direct donation. While there, be sure to click on their "Participants" page to see some fantastic photos.